In an early television episode of the science fiction series Star Trek the Next Generation, the crew of The United Star Ship Enterprise recovered an old, unmanned late 21st century spacecraft carrying the cryogenically frozen bodies of dozens of people who had died of various causes. Rather than have their bodies buried their families chose instead to have their bodies cryogenically frozen and sent into space in hopes that in the future there would be medical cures for the diseases they succombed to. Fortunately for them the ship’s doctor managed to revive many of the deceased patients using advanced 24th century medicine. As the story unfolded, a man who’d been quite wealthy back in the 21st century desperately wanted to reclaim his entire fortune (hopefully with interest). But he was astonished to discover that in the 24th century all forms of monetary economic exchange were now obsolete, and people no longer had to work for money to support themselves because all their human needs were met through technology, which costs nothing! People only worked because they wanted to improve themselves as human beings and help society advance. But this story is only science fiction and unfortunately in our lifetimes we’ll probably never live to see that day. Life’s sad reality is that the natural law of scarcity decides how big of a piece of pie each of us will get in life. Some will get more, others less, and some will get none at all. So unless you’re fabulously wealthy, most of us must trudge through life working (or depend on someone who does) in order to survive. And most who have been living and working awhile know that life and work at times can be analogous to four-letter-words. The vast majority of Americans are employees and must sell their services (physical or mental) to an employer for pay. Very few of us are self-sufficient. The cost of food, clothing, housing, transportation, and health care have become exorbitant, and it takes at least two incomes for a typical family to make ends meet. And since the start of the Great Recession in 2008, families are being squeezed even more with record high unemployment and growing under-employment (people working below their skill level). Companies are doing more with less people by squeezing every ounce of productivity out of their employees. Employees, afraid for their own survival, are buckling under the pressure. The meltdown of the home mortgage industry has pushed home foreclosures to levels not seen since the Great Depression, and a greater percentage of families are now renting rather than buying. And personal bankruptcies are at an all time high too. Americans are becoming desperate and losing their faith in the American capitalist system. In the past thirty years unbridled greed has led to business scandal after business scandal. In the 1980s there was the Savings and Loan debacle; in the 1990s and 2000s there was Sunbeam, Enron, Adelphia, WorldCom, and Boeing; and most recently there was Lehman Brothers, Bear Stearns, AIG and many other Wall Street firms. These companies only make up only the tip of the iceberg of dishonest and unethical companies that have shaken our faith in American capitalism. Let’s take a look at some startling statistics. The chart below shows the income inequality that preceded the Great Depression which began in 1929 and the income inequality that preceded the Great Recession which began in 2008. The chart below shows the distribution of wealth in the U.S. as of 2007. The chart below tracks average hourly pay (in constant 2008 dollars) between 1964 and 2008. In the chart below, compare the average CEO’s pay and corporate profits with that of the average production worker’s pay and the federal minimum wage. The numbers speak for themselves but suffice it to say that since 1970 the disparity of wealth and income in the U.S. has become more pronounced. We could even make the argument that this degree of disparity hasn’t existed in America since the gilded age of the late 19th century. This is not an issue of envy of the rich, but more of an issue of fairness and proportionality. Charles Darwin (the famous author of On the Origin of Species) did not come up with the famous phrase, “survival-of-the-fittest;” that, in fact, came from a lesser known Social Darwinist and contemporary of Darwin named Herbert Spencer. Basically Spencer extended the concept of evolution to justify economic and social inequality. He thought that if we just allowed the rich to get richer that it would be good for the whole of society because it would discourage the poor from having more children and ultimately surviving (a popular 19th and early 20th century belief call eugenics). Unfortunately, many academics, politicians, and pundits still advocate some form of economic Social Darwinism today. In the 19th century it was called laissez-faire capitalism; today it has been re-packaged under the name free-market capitalism. In the 19th century, the economic abuses of laissez-faire, free-market capitalism gave birth to the disastrous economic philosophies of socialism, communism, and fascism. 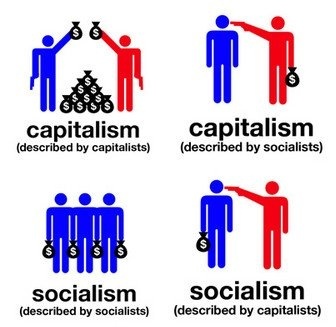 And when you examine the differences between laissez-faire, free-market capitalism and these opposing economic philosophies one thing you’ll discover they all have in common is their oppression and economic slavery of their workers. Essentially they’re different sides of the same coin. On one side, large multinational corporations control the means of production whereas on the other side the government does. Since the 19th century, most developed economies have regulated capitalism in order to prevent a repeat of those abuses. The famous economist Milton Friedman (1912 - 2006) of the University of Chicago was a big proponent of an unfettered, laissez-faire, free-market form of capitalism with little government intervention. In an influential article he wrote for The New York Times Magazine in September 1970 titled The Social Responsibility of Business is to Increase its Profits, Friedman makes the case that nothing other than the profit motive should drive business decisions. Not altruism, not the good of employees, not the good of society, not the good of any other business stakeholder should be considered other than what is good for the shareholders (or owners) of the company. And what is good for the shareholders is simply maximizing profit. Since then, many academics, politicians, and corporations have embraced this philosophy that the sole purpose of business should be to maximize profits for the shareholders and nothing else. CEO pay has become inexorably linked to the prevailing share price, and federal law stipulates that a company must value their corporation at the prevailing share price (mark-to-market or fair-value accounting). Executive salaries have become exorbitant while the average worker has seen their pay (in terms of buying power) decline. Further, there has been an overall decline in the number of well-paying jobs due to extensive outsourcing of jobs overseas especially in the manufacturing sectors. Since the publication of Friedman’s article, there’s plenty of anecdotal evidence to show that the shift in focus to maximizing profits for shareholders has led to a profit-at-any-price mentality by business managers. And today many academics, politicians, and pundits believe that we should return to the laissez-faire, free-market capitalism of the 19th century believing it will lead to greater economic prosperity. They believe that if we loosen the reins of government regulation then businesses will prosper and the economy as a whole will improve. They say, “a rising tide raises all ships.” But that same rising tide can swamp any boat that’s anchored to the bottom. The debate between how much governmental oversight businesses should have is immaterial. What we should be asking ourselves is what the real purpose of business should be? Is the purpose of business to only make money as Friedman believed or is it something more than that? Do we continue to follow Friedman’s philosophy or do we develop a new one? In short, I believe the solution to our economic woes today lie in developing a more virtuous form of capitalism! If companies were only in business to make money then anything they did to make more money would be all right. For example, if a business did not honor their warranties they’d leave their customers with defective merchandise or poorly performed services. Customers in turn would stop buying from them. If a business consistently mistreated and indiscriminately fired their employees, they’d have a hard time keeping their employees and getting new people to work for them. And what if businesses wouldn’t pay their bills? Suppliers and creditors would stop doing business with them. If a company’s only business is making money without considering the consequences to its customers, employees, suppliers, and creditors then it won’t be in business for long. To survive, a business has to strike the right balance between making money and satisfying their customer’s needs. So if you think about it, businesses aren’t really in business just to make money; they’re really in business to satisfy their customer’s needs. And if they’re consistent and successful in satisfying their customer’s needs, then they’ll earn a profit and the firm will thrive and survive. If a business doesn’t make a profit it’s an indication they’re not successfully satisfying the needs of their customers. Unfortunately, over the past three to four decades publicly traded companies have been more fixated on only satisfying the needs of their owners, short-term investors, and managers at the expense of their customers, employees, suppliers, creditors, and distributors. And all the businesses that have behaved unethically, immorally, dishonestly, and illegally over the past few decades are just a reflection of the American business culture today. Just as the crime-rate in a city is a general indicator of the health of a community, so the crime-rate in business is a general indicator of the health of business in our society. Where corporate scandals are high, so are greed, profit-at-any-price, and unfair dealings with customers, employees, suppliers, creditors, and distributors. For the most part, companies meet the community’s moral, ethical, and legal standards because it is in their own best interest to do so. The consequences of breaking laws or being sued by consumers are higher than the cost of doing the right thing in first place. Laws are generally made to criminalize what is wrong, but do not legislate what is right. There are unenforceable standards of right and wrong. Some examples would be that murder is a crime, but no law can be passed forcing someone to love their neighbor. Embezzlement is a crime, but no law can be passed forcing someone to be generous with their employees. Perjury is a crime, but no law can be passed forcing someone to be consistently honest. In the same way, many companies have rules set out in inspiring mission statements, guiding principles and value statements, but when push comes to shove their real mission and goals are to meet the shareholders earnings expectations and to drive management bonuses (which are usually based on short-term profit goals). And many times this is done at the expense of the other stakeholders (customers, employees, suppliers, creditors, and distributors) who really do add the most value to their organizations. So companies focus on short-term profitability, while keeping regulatory and liability issues in their peripheral vision. They avoid doing what is absolutely wrong, but their corporate culture does not focus on doing what is right. I believe that American business in general has become greedy and short sighted because most business leaders have lost their moral and ethical way. Without a moral and ethical foundation, people naturally choose what makes them feel good, or look good, but not always what is good. They choose the least painful or the most profitable solution, and they use situational ethics because they have no absolute standard of what is right or wrong. There’s only acceptable or unacceptable options in any given situation. It’s essential that a company make a profit otherwise it will go out of business and not survive. The late Steve Jobs once said, “Sure, what we do has to make commercial sense, but it's never the starting point. We start with the product and the user experience.” So rather than narrowly focusing on profits, companies should focus instead on satisfying the various needs of its primary stakeholders: the customers, employees, suppliers, creditors, and distributors. Doing this will not only make a company more profitable, it will produce much better results, prolong its life, and provide its employees and managers with a more fulfilling livelihood. Profit, after all, is a natural byproduct of consistently and successfully satisfying customer’s needs. Over the long run, working and doing business in an honest, ethical and moral fashion will be more profitable and professionally rewarding. Whereas giving in to short-term, expedient solutions is actually more expensive in the long run than doing the right thing in the first place.